Throughout the 1980s, as Guatemala was experiencing the worst years of its long and ghastly civil war, few foreign photographers, writers or journalists chose to make this country their home. And with good reason. The nation was terrorized by an ongoing conflict and a brutal, repressive regime that unleashed upon its citizenry some of the most heinous state enforced madness of the 20th Century. Jean-Marie Simon was one of those very few journalists who chose to live here, and in 1987 she published, Guatemala: Eternal Spring / Eternal Tyranny (W.W. Norton & Co.) The book is a moving and enigmatic presentation, often in the form of short vignettes of text and image that give the reader the sensation that the war, itself, is growing around them from a thousand different points in time and space. Reading this book is as important to understanding the Guatemala Civil War as reading The Art of Political Murder by Francisco Goldman is to understanding how its howling still echoes down canyons of impunity to this very day. In June of this year, for the first time, the book was published in Spanish and is finally available to a wider Guatemalan audience. La Cuadra was fortunate enough to secure an interview with Ms. Simon about her experiences living in Guatemala during the war, and the creation of a book which captures those years in ways that no other work has done. 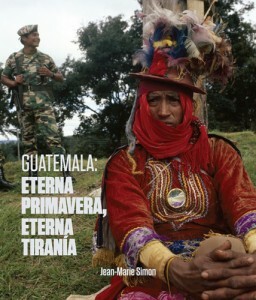 MT: Jean-Marie Simon, welcome and congratulations on the re-publication, in Spanish for the first time, of your book, Guatemala: Eternal Spring, Eternal Tyranny. JMS: Thank you, I am glad to be here. MT: To start, I have a direct question: were you a reporter during the time that you were writing the book? JMS: Yes. There were lots of us here. There were many good reporters here, but the problem is that most of them just came and went. For example, Marjorie Miller of the L.A. Times, who I consider a great reporter, she couldn’t spend a month in Guatemala. MT: Right, helicopter in, helicopter out. JMS: Well, yes, but her helicoptering in was good. There would be these pilgrimages to Guatemala for elections and coups, and every once in a while, if something bad happened, they’d arrive en masse from the Wall Street Journal and The New York Times. They’d do their interview with the Commander of some region. Maybe they’d go up to Nebaj for two days. But as a photographer and journalist that just didn’t attract me. As I said last night [at an event celebrating the book’s release], I started out just wanting to be a photographer, a great photographer. I wanted to be a big name and go from place to place and shake the world with my images; then I got sucked into Guatemala. And I decided, while I wanted to be great, it’s more about being useful. I thought, well, I speak Spanish. I can talk to people and I’m a pretty good photographer and I learned to be a good listener to people here. They’re such good storytellers. But I decided that my utility was combining the photographs with testimony because I was hearing much more than I could express in a photograph. And the reason I was hearing it was because Aryeh Neier, who was with Americas Watch, which became Human Rights Watch, learned that I was in Guatemala and that I was talking to people and there were no reporters here long term. So he put me to work writing reports on Guatemala, and I started to enjoy interviewing people. And then it became an identity crisis. Do I take the picture? Do I photograph people? And the photographs probably suffered for it because, maybe, I could have taken the photography to another level if I’d just stuck with that and jettisoned the interviews, but it just wasn’t that useful to do that here. Beautiful pictures of a war are not going to do much for a country. But reporting, I think, did. So I wrote Human Rights Watch reports on Guatemala from 1982 to 1987. And after some time there were so many people showing up in my hotel room, my little hotel room on 6th Avenue and 12th Street in Guatemala City, which is now a narco-hotel. I lived there for six years. And people would come to my hotel. Peasants aren’t going to go look for you in Zone 10. But they will look for you in Zone 1. Because they get off the bus where the terminal used to be in Zone 4 and then they’d walk to my hotel. And Zone 1 was such a melting pot of people that they’d fit in, and they’d come up to my room, bring a coffee and we’d talk. MT: And they’d seek you out because they knew you were there and they knew you were telling their stories? JMS: They really trusted me because they knew who I was working for. And it was like a chain effect where someone trusted me, and then they told their friends and they told their friends and so on. MT: Okay, so here’s the reason I asked if you were reporting during the war: you were a known entity in Guatemala. The positive side being people came to seek you out, looking for somewhere to tell their story. The other side is that the military knew who you were, too. Did you ever feel threatened? Was your life ever in danger? Very thoughtful interview, Mike. What struck me the most while reading Jean-Marie’s book is how indian everybody looks, army and guerrillas alike. Associating with the «winners», their values and lifestyles, to the point of doing their dirty work for them, at the expense of your own kind, is the principal malaise of this country and continues to be to this day. I don’t have to tell you to keep up the good work because I know you will, so I’ll just say till we meet again, and congrats. Thanks La Cuadra for this interview, and thanks Jean-Marie for your valuable work in Guatemala, I’ll try to look for it, and I think your book won’t let us to forget what happend here, and that’s very important.